Mysterious masked figures and creatures appear from shadowy backgrounds as if walking in from another universe or time. Yassine Balbzioui invites the viewer into the world of the in-between, the point where reality and the imagination meet. In this space, anything is possible, be it birds dressed in suits or the state of Half Flying. The Moroccan-based artist’s debut exhibition at the Kristin Hjellegjerde Gallery Berlin presents a new body of work that challenges all distinctions. The striking portrait of “Yellow Boy” depicts a small boy standing in a pose of apparent dejection. Wearing a yellow mask and hood with a cape tied around his neck, we instantly recognise the costume of a super hero. Take a closer look at the cape and we see that the fabric is patterned with what we might imagine are the illustrations of the boy’s fantasies. All of these things are typical of child’s play and yet there is a palpable sadness in the painting, as if the boy is coming to terms with the very real realisation that he cannot fly. He is stuck at the cusp of an imagined world — an example of Balbzioui’s in-between spaces — which he can never enter into or fully materialise. In this way, we see the dark underside and frustrations of not just Balbzioui’s dream worlds, but of all dream worlds in the sense that they are always unattainable except within our minds. This is also evident in “Hiding With Love.” At once evoking a classical setting — reminiscent of Shakespeare’s Romeo & Juliet — and a strange no-place with a blackened background, the painting is imbued with tragic humour. 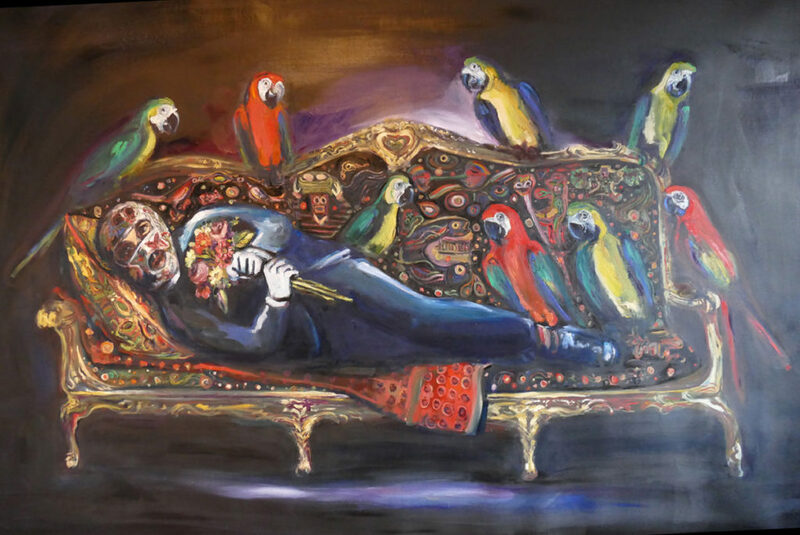 The figure is reclining, clutching a bouquet of flowers and wearing a floral balaclava in half-disguise, whilst parrots perch around him. The birds — a recurring motif in Balbzioui’s work — are both symbolic of flight and the character’s inability to fly, whilst their ostentatious colours mock any attempts at hiding. The same classical style sofa reappears in “Waiting for Action Movie”, a painting which also further illustrates the multiple layers at play in Balbzioui’s work. If we take the title into consideration, we might assume that the balaclava-wearing characters are actors waiting in-between takes. Caught in a limbo off set, the figures are half in character, half not; whilst they are still wearing their costumes, they show awareness of being looked at by posing for the “camera”, or the artist’s paintbrush. Thinking about contemporary culture and photography, we might consider how we play roles in our everyday lives, perhaps even as we enter a gallery to view artwork. Balbzioui’s video performances further animate the theme of role playing. In the short film ‘The Fish Inside Me’, we see a masked figure attempting to row across a makeshift sea in a plastic wash tub with wooden sticks for oars. Whilst an amusing image, the painful noise of the tub scraping along the ground combined with the fixed gaze of the mask creates an unsettling atmosphere. The figure appears physically otherworldly and yet his inability to unleash his inner fish is marked by the volume of the sound, as if voicing his frustration. In the video ‘Khalimna’, the performers engage more explicitly in the absurd. Here we have figures wearing giant, colourful animal masks riding around on bicycles in the woods, a man wiggling across the ground in a silver tube, another man attempting to read whilst milk is poured onto his head, a man wearing a lion mask in a paddling pool, two men pillow fighting wearing tights as long, thin trunks whilst a sped-up audio track plays in the background. At several points in the video, the third-wall of performance is broken down as we see the actors laughing at themselves or the images that surround them, encouraging us to view the artwork as an experiment in fun. Indeed, Half Flying is an exhibition that presents us, most significantly, with possibility. The possibility to exist in two worlds and states at the same time, to avoid definition or finality, and to float between. At a time when contemporary culture increasingly demands that we split ourselves between work and home, our real and digital lives, Balbzioui’s work offers us a place to remain still and contemplate different ways of being.